A powerhouse performance, that as difficult as it may be to believe, the music was composed and performed on the spot with only a slight bit of discussion, some basic ideas of chords, perhaps a visual drawing, and/or suggestion of atmospheres. The chemistry and interpretations are incredible. While not totally what one would call free improv, this is one of the finest examples of masterful circa-improvisation your ears will ever witness. Many will know and compare ‘Lighthouse’ to a previous MoonJune release ‘The Stone House’ but one change is the bassist Markus Reuter, bringing a wider range with TouchGuitars (which combine both guitar and bass for a prismatic result). 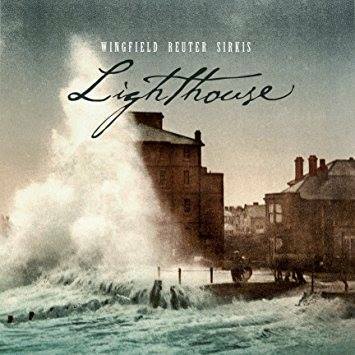 While I truly miss Yaron Stavi, who did brilliant bass work on ‘The Stone House’ as well as a top 2015 pick of mine ‘Proof of Light’ (also with Wingfield on MoonJune), I had no fear or problem welcoming the entrance of Reuter for ‘LIghthouse’. Just as a bit of trivia, the recording of ‘Lighthouse’ was made in Catalonia, Spain on February 18th, 2016. This was actually before ‘The Stone House’, but both were done in a six day gathering in this same time frame. According to Leonardo Pavkovic (executive producer, MoonJune label owner) there is enough music from that week long session to make yet a third release, so that is something to look forward to. The listener will soon discover a bit more edge, Crimsonesque progression, and slightly distortion laden exploration. Wingfield burns bright, Reuter brings on the intensity, and I’ve never heard Sirkis play drums like this. The trio are ferocious with a more progressive rock /jazz fusion posture than anything Wingfield has originated before (except of course the connected ‘The Stone House’). For the sake of references, fantasize combining King Crimson (the heavier side), Richard Pinhas (Heldon, solo), Stick Men, David Torn, and Dark (with Mark Nauseef). ‘Lighthouse’ is an all instrumental set of seven profuse and shrewd compositions. A gathering of three strikingly prolific musicians proves to be legendary once again. HIGHLY RECOMMENDED.